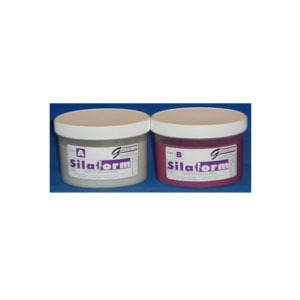 Silaform Extra Hard Silicone Putty is a one to one mix material, excellent for a variety of dental related procedures. With a Shore A hardness of >90, Silaform resists deformation and abrasion normally associated with silicone putties. The absence of expansion and contraction offers endless possibilities for this economically priced product from Garreco. Silaform 70 Hard Putty has the same great working properties as the 90, but in a softer, more flexible version. Shore A hardness of >70.